EASTSIDE MATERNAL AND FETAL MEDICINE :: BELLEVUE, WA :: The ultrasound images are from Kristie's tummy, approximately two months into her pregnancy! These fuzzy little blobs would become our beautiful twin daughters, who we enjoy and love so much today! For the eight years that Kristie and I have been a couple, we were 99% certain we would not have any children. We were having too much fun and didn't want to risk it with a major life change. But a series of events within the past year made us reevaluate our decision. We were spending more time with our parents, realizing the joy they experienced through us. They seemed to be thanking us for one thing or another daily, and we were clearly a source of great happiness and pride in their lives. Were we willing to deny our own lives of that experience, just so we could go on a few more vacations together or perhaps climb a couple more rungs on the corporate ladder? Frankly, those trips - amazing as they were - we're starting to blur, and we were very satisfied with our personal and work accomplishments thus far. We had arrived at a pretty good point in our lives. My sister then gave birth to our wonderful neice. We visited her in the hospital, and something about the experience triggered many tearful conversations between Kristie and I over several weeks. I wasn't pushing one way or the other - as long as I was with Kristie, I knew I would be truly happy with kids or without - in the end, however, we decided to go for a child... And we got two! As many of my friends have said, there isn't a finite amount of love in a family. Having a child (or two!) does not mean that Kristie and I would need to love each other less in order to provide a part of that love to the child. It seems ridiculous now, but that's something we truly feared. But as we've discovered, adding children just multiplies the love in the home. I love Kristie more than ever now - for bearing our girls and for being the wonderful mommy she has become. And of course there's a double-helping of a love just as strong for our precious and perfect girls. Although they're only months old, I already feel some of that love being returned through their big smiles, their tiny outstretched arms, and their devastatingly heartwarming giggles. Parenthood is awesome! We wouldn't trade it for anything (and we're so glad we didn't)! 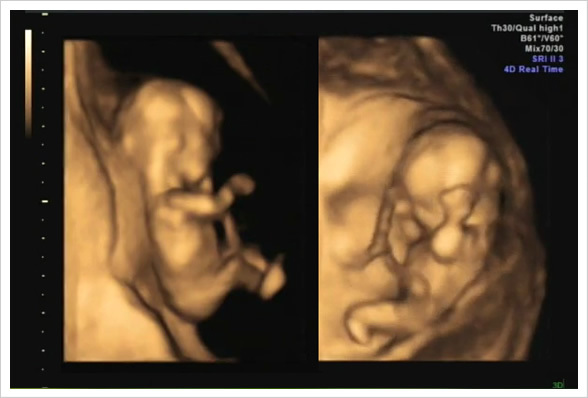 2D & 3D Sonogram of Our Twins from John Brown on Vimeo. Thing 1 and Thing 2 at 12 weeks! Just over two inches long, bouncing around in mommy's tummy with healthy heartbeats! This entry has been viewed times. Well that's great news. I kept on looking in, and finding no updates, and began to worry that something had befallen my favourite photobloggers. Well being befallen with twin girls is absolutely wonderful news and really pleased for you both. Hope to see some occasional updates as your family grows. Holidays can still be enjoyed, just in a different way - your gonna love it when a child in a backpack throws up over your neck and all down a display cabinet in a tourist store! Thanks, Keith! Yes, you're right. I'm very much looking forward to when they are older and we can take them on trips, enjoying the sights for ourselves and also via their fresh eyes. As they explore their world, I'm sure they'll prove to be beautiful and frequent subjects of my photography. Hey! Your twins-room is soooo lovely! We got twins in May 2010. When the boys are born, the idea to create www.zwillingsland.de was born too! We wish you a wonderful lifetime journey in the "twins-world"! !